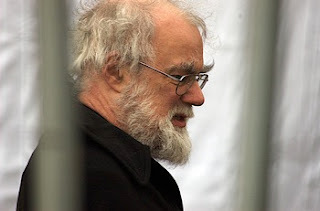 "Too many theologians writing about Augustine in recent decades have fallen under the malign spell of Olivier Du Roy's substantial monograph of 1966 on faith and intelligence in Augustine's Trinitarian thought – an essay which argued in detail for an almost unqualified Platonism and individualism in Augustine generally, and an isolation of his Trinitarian theology from the economy of salvation. Du Roy's book, along with a somewhat misread passage in de Régnon's studies in the history of Trinitarian theology, produced a curious 'received wisdom' about Augustine as the source of all the theological ills of Western Christendom or even Western society; he appears to have been responsible for everything but the common cold." "Yet, it is true that, in this volume at least, Agamben offers few, if any, suggestions as to how the subject could break out of the spell of glory. Angels and bureaucrats conspire to make oppression ordinary, and even aesthetically pleasing; any capacity of resistance to the kingdom is shattered, as glory reasserts its transcendent and immutable character. Those readers who persevere to the end of the volume must wait for the next installment to receive their reward." For more on Agamben's book, you can't go past Adam's invaluable synopses.